Peacefully with her family by her side, our mother, grandmother, great-grandmother, sister and friend went to be with the Lord on Monday, December 3, 2018. 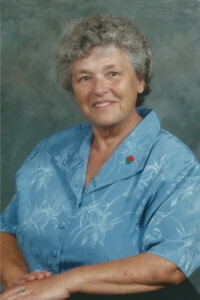 She will be missed by her children, Jean-Louis (Brenda), Raymond (Joanne), Marcel (Louise), Ghislaine; daughter-in-law Debbie; 9 grandchildren; 8 great-grandchildren; and her 2 sisters, Lucille and Helene. Mom was predeceased by her husband Robert and son Jacques. Mom was born in Otterburne, MB on October 21, 1933 to Marie and Alphonse Roy where she spent her childhood on the family farm. In 1952 she left her family and moved to Powerview to be with her husband Robert where they raised their family. Mom’s greatest joy was being surrounded by family. She was very involved in the church, including teaching catechism, singing in the choir and being an active member of the Catholic Women’s League. She also loved playing cards, reading, baking and helping others. The family would like to thank her friends and home care workers at the Winnipeg River Manor and most recently the staff at Sunnywood PCH for all of your help with mom. Many thanks to Dr. Ota, and to her two special care givers Lyndsey and Kaysen for your wonderful care and compassion. There are no words that can express how thankful we are that Mom was able to live out her last years surrounded by such caring, loving friends and family. Cremation has taken place. Prayers will be held at the Notre Dame du Laus Roman Catholic Church in Powerview, MB on Saturday December 8, 2018 at 1:00 pm with mass to follow at 1:30pm. In lieu of flowers, donations can be made to Notre Dame du Laus RC Church Building Fund, Box 265, Powerview, MB R0E 1P0. My deepest sympathies to all the family. May you all feel God’s presence and comfort knowing that she is now Home to Heaven and rejoicing with her other loved ones. I know you all have a lifetime of wonderful memories knowing that she loved each and everyone of you dearly, I have many fond memories of Matante , God Bless and love you all. Our sincere condolences to all the Guay family. Madeleine was a wonderful and kind person. My condolences. Your mom was a great lady. Always had time to say hi. Sorry can’t be there. I live in Mexico. Condolences to the family. Madeleine’s smile will be missed!! Our sincere and heartfelt condolences for your loss. We are sad that we are far from you in your time of sorrow. Take comfort in knowing that she lives on in each and every one of you. It was a great honour to share a small part of such a wonderful person’s life. Our deepest sympathy for the loss of your mom….Matante was always a happy person to be around. JL & Brenda, I’m so sorry for your loss. Losing a mother is very difficult. My thoughts and prayers are with you. I cherish the memories of your Mom, my Godmother.